Born 1958, and lives near Salemburg, North Carolina. Contemporary folk artist Jeff Williams has long been represented by Robert Cargo Folk Art Gallery in Tuscaloosa, Alabama, and Renee Fatouhi Fine Art, East Hampton, New York among others. His work may also be viewed in the permanent, Lynch Collection at North Carolina Wesleyan College. 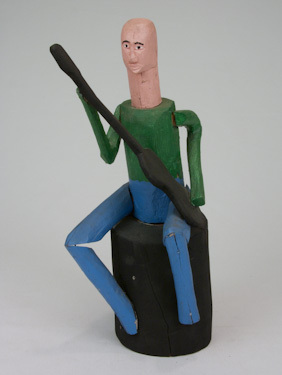 His sculpture was collected and then included in "African-American Folk Art" from the collection of Dr. A. Everett James in 1991 at Fisk University, Nashville, Tennessee. He began carving as an adolescent, one of fourteen children. His work as a carpenter and mechanic over the years augmented his natural abilities with the chisels and files he uses to shape his creations. We purchased two figures from the sale of the Howard Smith Outsider Art Collection at Kimball Sterling Auctions in Johnson City, Tennessee, February 19, 1994. 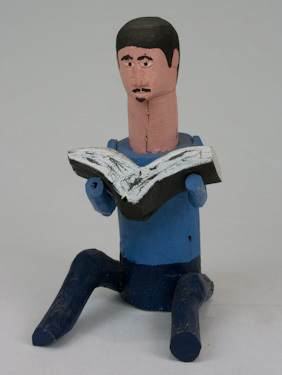 The wood carved work was described as "Man with Banjo" and "Carved Man Reading Book." It was our first occasion to see his work and assume the work to be early and earnest given it's impressive provenance.